Bonny Lea Farm has been giving hope to people living with disabilities for forty- five years! Hope for a welcoming community. Hope for independence. When you support Bonny Lea Farm, you help us keep that hope alive. Our founders had a vision for people who live with the everyday challenges of a disability – hope for a fulfilling life with opportunities to learn, grow and succeed. We still have that vision and hope you do too. I would like to introduce you to Dan. This time last year, he had recently finished school. He had always lived at home with his Mom. He had never worked full-time. He and his Mom came to Bonny Lea Farm for a visit. They hoped to find a place where Dan would feel at home. They hoped to find a place where Dan could learn and grow. They hoped to find a community that would engage and empower him. Their hopes aren’t so different from yours and mine. Dan moved to Bonny Lea Farm in January. 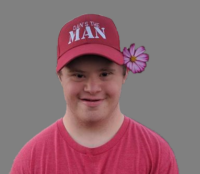 Today, he is living in one of our group homes with four other participants. He is learning new life skills, making decisions and gaining independence. He is also making friends. His personality and sense of humour are enjoyed by his housemates and staff. During the day Dan has been getting used to the work routine in our Transition Program area. This provides him with easy access to our snoezelen room for relaxation, an introduction to the work of each of our social enterprises, and a quieter setting to help make the transition from home and school to work a successful one! We know there is a bright future for Dan here at Bonny Lea Farm and we are thrilled to be able to offer him this opportunity. You can be a part of making Bonny Lea Farm a place where hope is born and dreams come true. We estimate that since 1973, we have given hope to over 300 people living with a disability. Today we support 46 participants from across Nova Scotia in our residential, vocational and enhanced programs. About 75% of our funding comes from the provincial government. We raise the remaining 25% from foundations, grants, our social enterprises and investments made by supporters like you. We rely on donations to pay for our enhanced programs to meet the needs of our participants; improving accessibility with equipment purchases and adapting our spaces; upgrading our buildings to enhance the comfort and safety of participants, improve efficiency and reduce operating costs; staff training; and advocating and educating through community engagement and outreach to increase understanding of the unique abilities of participants. Help us continue to be a place of hope. Hope for today. Hope for tomorrow. Hope for the future. To learn more about the impact of your gift, please check out our Annual Report. It is loaded with stories of how you can give hope, dignity, confidence, and so much more to the people who live and work at Bonny Lea Farm. Join us by giving the gift of hope this year!